Sorcerers of the Magic Kingdom: Fun for the whole family! Sorcerers of the Magic Kingdom is an interactive and immersive scavenger hunt that takes you on a quest to stop the Disney villains in their evil schemes. Utilizing a special “key,” guests travel from land to land, finding secret portals and completing spells from their spell cards to defeat the nefarious scoundrels from succeeding in their plans. 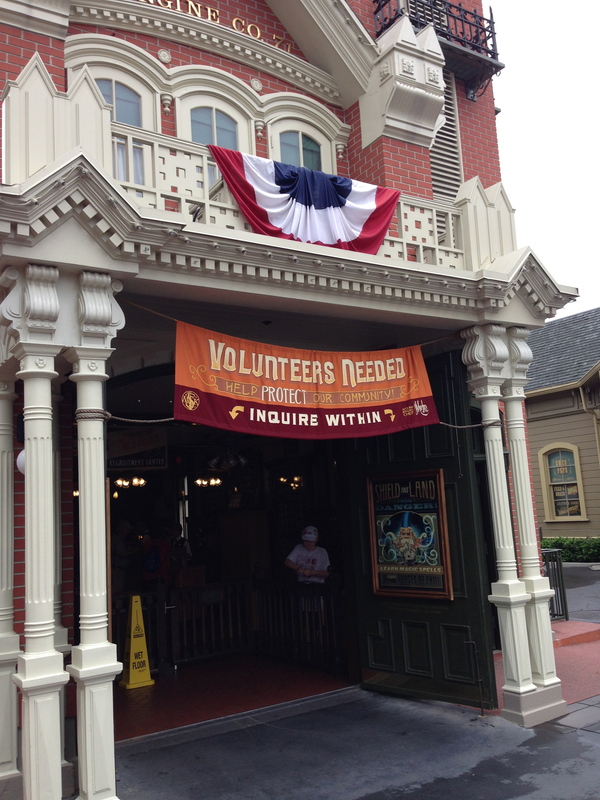 You begin on Main Street USA in the Magic Kingdom when you sign up at what used to be the Fire House, but what is now the sorcerer’s recruitment station! Inside, you’ll view a short introduction video from Merlin who is training new sorcerers for the task ahead. He tells you that the villains are afoot in the park and your help is needed! 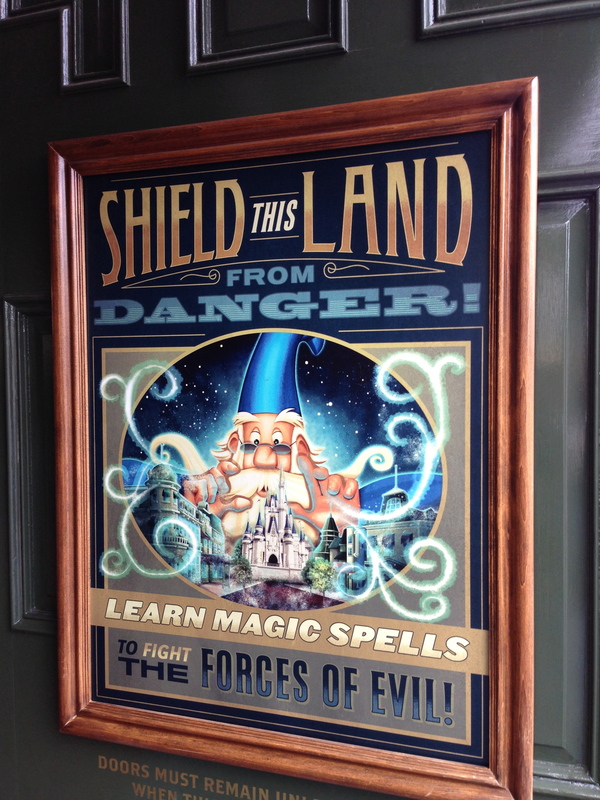 Come and enter all would be sorcerers and defend the Magic Kingdom! When you get to the front of the line, you’ll register your name with the Cast Member who will process you. They will then take you to the “training area” where they will teach you how to use your new key card and set of spell cards that you’ll be given. For each day you’re in the Magic Kingdom, you’ll receive a new set of cards each day if you check in at the recruitment station. Cards come in different varieties and different strengths and are common, uncommon, and rare. Special super rare cards can only be found in sets you can purchase in merchandise locations (rare cards are randomly inserted). After being trained, you’ll be sent off to your first portal to find out what you need to do next! Entering into headquarters, you’ll receive your cards, map, and training here. Portals are found all over the park – in Fantasyland, Main Street, USA, Liberty Square, Frontierland, and Adventureland. Different symbols on your map represent the different areas you’ll find the portals. Fear not, each portal will guide you to the next and should you go to the wrong portal it won’t hurt your quest. It will simply remind you where you’re supposed to go. At each location, you’ll face a different challenge and you will have different tasks to accomplish. While fighting the villains, you’ll need to use your trusty spell cards by holding them toward the portal. What’s great about the cards is that each one is not only unique to look at, but they produce specific in-game effects. Doris’ Bowler Hat Attack produces a slew of bowler hats that attack the enemy. Colonel Hathi’s Righteous Stomp sends a stampede of elephants across the portal. And so on. Join Merlin’s troops and defend the Kingdom! The ingenuity of the game is that it is a different experience for everyone. Not everyone starts off in the same place. Not everyone encounters the same villains. Not everyone solves problems the same way. The variety of spell cards, villains, and locations makes the game incredibly fun and challenging. From what I understand, the more you play, the more difficult the game becomes and the harder it is to accomplish the task. It is amazing to see how this kind of interactive technology is being utilized as an added level of entertainment in the parks. One of the great things about Disney and their Imagineers is the way they continue to add value to every aspect of your visit. 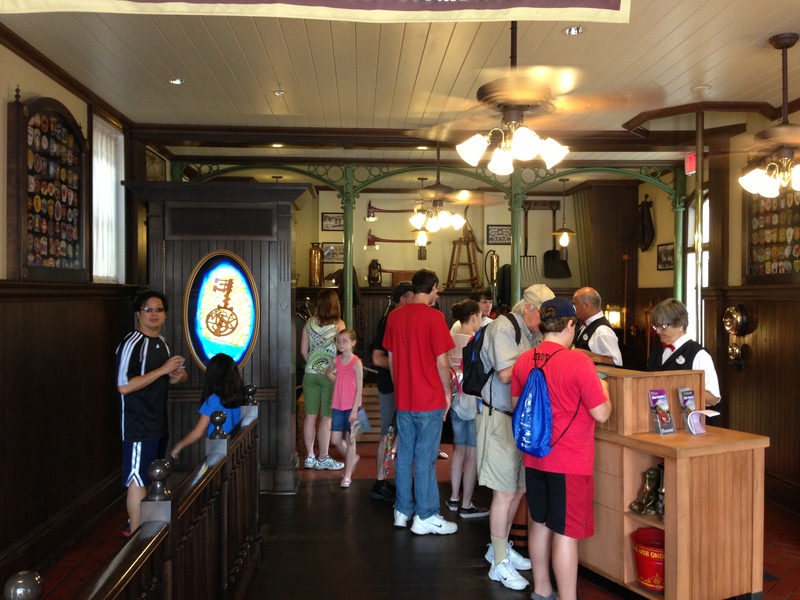 From queue lines to the FastPass, they are always looking to find a way to “plus” the experience as Walt would say. This is a great FREE souvenir of your visit to the Magic Kingdom so even if you don’t play, go, register, and pick up your free cards. They are very well done and fun to collect. However, if you think it’ll be something quick, you would be incorrect. The value of the game is that it is intricate, but that intricacy takes time. Playing through my first level against Scar took a considerable amount more than I expected as I went from location to location completing tasks. The beauty is that I rarely encountered a wait at any portal and was able to play continuously. But the quest does have you crossing the land a variety of times and in the Florida sun it can be tiring. This is an ideal fun diversion for when lines are especially long in the afternoons or perhaps something the kids can do while you’re holding a spot waiting for the parade. It’s also great for adults who choose not to ride the rides and want something fun to do on their own (although some pretty jealous kids will wish they shared in on the fun). All in all, Sorcerers of the Magic Kingdom is a unique, fun, and exciting addition to the excitement you’ll already find at Walt Disney World. For a quick summary of the game, you can view details on the Sorcerers of the Magic Kingdom page on the WDW site. For some tips, hints, and tricks, read about the game on the Disney Blog!